Open office space utilizing glass as a way of partitioning offices and cubicles continues to be a growing trend for building owners, architects and space planners. The open space creates a friendly environment and studies have shown that these open environments contribute to happier and more productive workforce. Tri-City Glass has been involved in commercial glass installation for decades and we are experienced with all phases of office glass installation. Looking for a unique office look? At first thought glass might not seem like a suitable material when it comes to privacy. 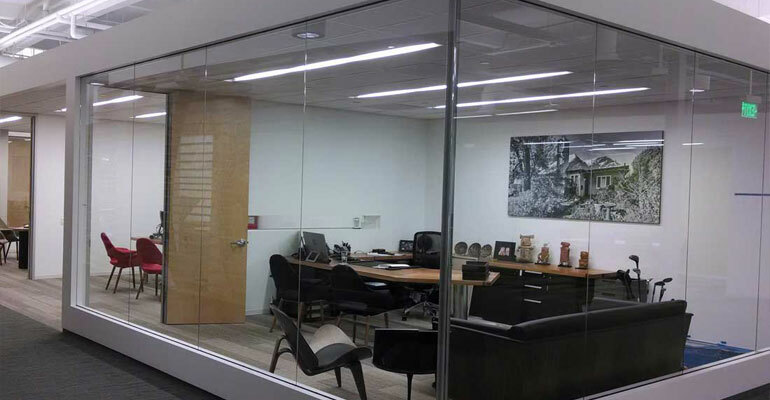 However insulated glass and laminated glass can reduce or eliminate sound penetration within offices and there are variety of ways such as frosted glass to obscure views. Glass not only makes an excellent choice for privacy, office interior glass is thick, safe and secure. The foyer or entrance to your office gives it character and acts as the first impression visitors will have of your business. Using office interior glass in the foyer leads to an impressive visual effect. This gives off a fresh look and allows natural light to flood into your office. Could your office use a more open, inviting look?